John Orlando Parry (1810–79) was a musician, artist, entertainer, comedian, singer and song writer, and a popular figure in Victorian society, collaborating with the likes of Charles Dickens and Franz Liszt. Despite this he remains an elusive figure, partly because his work spanned so many different fields. An inheritor of the Welsh musical and poetic traditions through his father, the Welsh musician John Parry (Bardd Alaw), he became a metropolitan and cosmopolitan figure as a song writer and performer, more at home on the London stage or the European concert platform than in rural Wales. 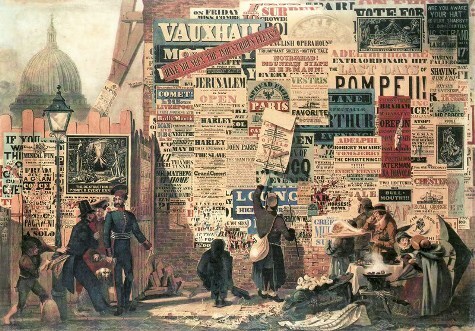 Despite being a largely occasional and self-taught artist, he produced one of the most famous nineteenth century images of London streets which showed, among much else, a wall covered with advertisements for plays and concerts. He also produced two sequences of caricatures in idiosyncratic formats - one, largely structured by visual and verbal puns offering humorous commentary on his musical interests, and the other, even more eccentric, a compilation of miscellaneous comic images published under the title of Ridiculous Things. In this illustrated lecture, Professor Brian Maidment seeks to position Parry both within and against the British tradition of comic art in the 1840s and 1850s. If unlikely to become a major figure, Parry is nonetheless well worthy of serious consideration as a comic artist. This lecture is free to attend and open to all. To book a place please email lectures@glyndwr.ac.uk or call 01978 293466.